Against the backdrop of terraced hillsides covered with vineyards and thousand-year-old olive trees, over a thousand people of all ages and backgrounds come together every summer to learn Tanakh. Amid the everyday miracle that is Israel, a Jewish renaissance is underway. One of the many expressions of this revolution in Jewish learning is the annual Tanakh Study Days, a week-long celebration of the Tanakh in all its complexity. As we are only two months away from the start of the Shmittah Year, I signed up for several classes on Shmittah, as well as some lectures by such luminaries as Rav Ya’akov Medan and Rav Yoel Bin Nun, who have been among the true movers and shakers of the current revolution in Jewish learning. Most of the speakers were unknown to me, but had I googled them ahead of time, I would have learned that several of them are the experts in their fields. Among the lecturers on Shmittah were Rav Ze’ev Vitman, R’ Eliezer Kashtiel, and R’ Meir Nehorai. Each of them presented a different aspect of the issue, and unsurprisingly, very few of their views overlapped! Shmittah: Social law or religious commandment? R’ Ze’ev Vitman’s class was titled “Shmittah and Shvitah”, which translates roughly as “Remission and Cessation”. R’ Vitman opened with a question: Is Shmittah a mitzvah bein adam l’chavero (a social law) or bein adam l’Makom (a religious law)? Either year would support the social aspects of the mitzvah. After all, farmers who haven’t sown their fields or harvested their crops are not going to be in any position to repay loans in either the seventh or the eight year. If anything, they’ll be eking out a subsistence living during those years. Thus, the requirement not to collect loans while the Shmittah year is in progress would appear to be a form of “Tikkun Olam”, that is, a law that comes to rectify the negative social consequences of existing laws. But the odd thing here, R’ Vitman pointed out, is that the text in Dvarim nowhere mentions Shmittat Karkaot—the agricultural Shmittah. And so we moved on to the second source for Shmittah, Shmot (Exodus) 23. Note that in the case of Shabbat, the word “l’ma’an”—”in order that”—plays a crucial role. We are to cease working so that our families, our workers, and our farm animals may rest. 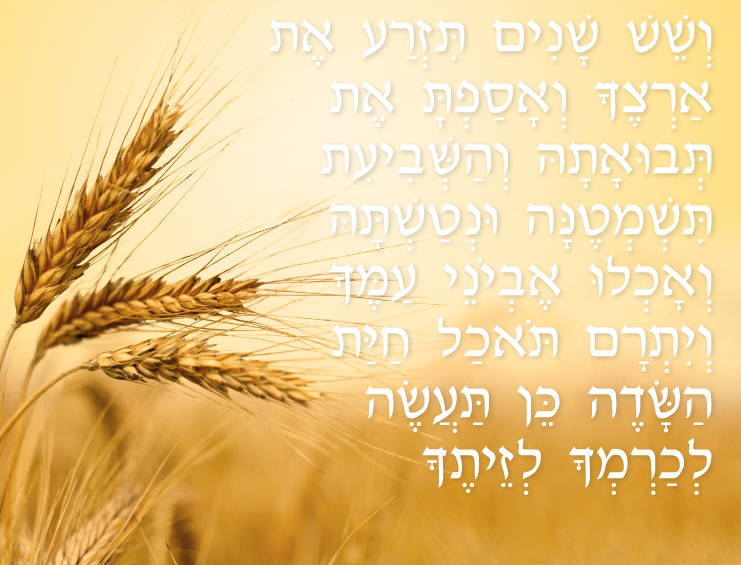 It would appear that Shmittah is a parallel to Shabbat: we are to refrain from sowing and harvesting, which is followed by the statement that the fruits will be for the poor and the beasts of the field. And yet, the word, “l’ma’an” is missing here! Also, if the reason for the Shmittah is to allow the poor to eat of the ownerless produce, why the ban on planting and seeding? Surely it would be advantageous to the poor if the farmers were to plant crops for them to gather! This would seem to argue against Shmittah being purely a social issue. Meanwhile, the text in VaYikra also connects Shabbat and Shmittah, but in a far more direct fashion. Rather than the term “Shnat Shmittah”—the Shmittah Year—VaYikra calls for a “Shabbat for the Land”, an agricultural parallel to the weekly Shabbat observed by human beings. Interestingly enough, this Shabbat is mentioned exactly seven times in the relevant text. Rav Vitman pointed out that the Shmittah involves the setting apart of the produce as Kadosh, something special, akin to the produce set aside for Kohanim, who must eat them in a particular state of cleanliness. This is perhaps to be expected; after all, VaYikra is called Torat Kohanim! As for social welfare, the Shmittah year appears to be setting us up for potential disaster. Considering that the ban on sowing and harvesting can affect three years’ worth of produce, it’s natural to wonder what we’ll eat in the interim. So there is an element of trust in all this. It’s accepted at the outset that keeping this “Shabbat of shabbats” will not be easy. This radical requirement—that we throw caution to the winds and trust that we’ll have enough to eat is unprecedented in the Torah. Generally, when material welfare is at stake, the Torah tends toward relaxing religious laws in order to strengthen social laws. Mitzvot bein Adam l’chavero generally take precedence, a trend that has been carried over into the Mishna and Talmud. But then, this is Sefer VaYikra—Torat haKohanim. Having been told that we must be a nation of priests, we may not find it so surprising that the entire nation is held to a high standard. For R’ Vitman, the bottom line of Shmittah is the understanding that we aren’t in charge, that our land, our fortunes, and our lives are not our own. Together with this is the inculcation of a certain degree of trust—even of naïve optimism—that we’re in good hands. It’s about letting go, and about relinquishing our constant pursuit of ownership. But there’s more to it that just an exercise in trust. In his class: “Between Shimttah and Yovel,” R’ Eliezar Kashtiel emphasized the intimate connection between Shmittah and Yovel. We are to count seven of these Shabbatot, after which we are to blow the shofar on Yom HaKippurim and declare “Freedom in the land”. The fiftieth year is to be a year of restitution—indentured servants are to go free, debts are to be forgiven, and land sold under economic duress is to revert to its initial owners. It is the idea of financial and social Shmittah taken to its ultimate conclusion. During the Shmittah, inequalities between the haves and have-nots are to be evened out as far as possible. The produce is free for to all comers, regardless of where it grows. Gates must be left open to allow entry to anyone who wishes to eat from one’s trees. The Shmittah is the great equalizer. But the Yovel goes way beyond that—it erases economic hardships and misfortunes in a single bold step. וְהַעֲבַרְתָּ שׁוֹפַר תְּרוּעָה, בַּחֹדֶשׁ הַשְּׁבִעִי, בֶּעָשׂוֹר, לַחֹדֶשׁ; בְּיוֹם, הַכִּפֻּרִים, תַּעֲבִירוּ שׁוֹפָר, בְּכָל-אַרְצְכֶם. To say: to you (singular) I will give the Land of Canaan, the portion of your (plural) inheritance. On this latter passage, Rav Kook writes that the juxtaposition of singular and plural is an expression of the inner reality reflected in an outward condition. Each individual Jew has his or her own place in the Land, while at the same time, the Land is given to Am Yisrael as a whole as an eternal inheritance. Or, as the Tosafot said regarding collateral for loans, “Each individual Jew owns four cubits of the Land of Israel” (meaning that no one can refuse to lend to his fellow on the basis of lack of collateral). The significance of the Yovel, argues R’ Kashtiel, is to bring us all back to the foot of Mt. Sinai. The text is phrased to remind us that no one of us is “only” an individual, while at the same time, teaching us the value of individual freedom. Observe (lit. Keep, protect) the Shabbat so that you, your family, your workers, and your animals can rest. What is the common denominator? Like Shmittah, the Shabbat requires us to loosen our grasp. The prohibitions of work on Shabbat include exactly those things that set human beings apart from other animals—creative, pre-meditated work. (More on the connection between Shabbat and Gan Eden). To refrain from work on Shabbat is to reenter the world of our pre-human ancestors, to revisit Gan Eden. Bottom line: Social or religious law? But why these particular mitzvot? R’ Nehorai’s answer—following the Ramban—is that the mitzvot of Shmittah and Yovel actually contain a host of other relevant mitzvot—both social and religious. These mitzvot lay out a complete program of social and religious living that encompasses respect for others, for the the land, and for God. Both Shabbat and Shmittah are thus reminders of a life free from any great effort on our part at securing sustenance, but also free from the moral and ethical challenges of free human beings, who are faced with inequalities on all sides. But what do these reminders do for us? Why do we need them? The three different teachers emphasized different messages, but there was one thing on which they all agreed: the central message of Shmittah is that the land does not belong to us, that we are indeed sojourners on Hashem’s property. We are to surrender ownership as a reminder that nothing is really ours—everything belongs to Hashem.